Rejecting the NY Giants' argument that the purported fame of its G-MEN mark must be considered in the Section 2(d) analysis, the Board found the mark (for "shirts; T-shirts; tops") likely to cause confusion with the registered mark GMAN SPORT & Design for overlapping goods [SPORT disclaimed]. In re New York Football Giants, Inc., Serial No. 85599795 (July 3, 2014) [not precedential]. [W]here there is no specific limitation in the description of goods and nothing inherent in the nature of Applicant’s mark that restricts Applicant’s usage to football related merchandise or the promotion of a particular football team, the Board may not read such limitations into the application." Moreover, the Board noted, there is nothing to stop the Giants from changing the manner or scope of use of the mark. [Or selling or licensing the mark to a non-football-related owner - ed.]. The analysis of the marks was straightforward. As to the meaning of applicant's mark, the Board perceptively pointed out that "though Applicant argues that G-MEN is essentially a synonym for the name GIANTS for a football team, this may be known only by football fans, or even only those fans who favor the GIANTS; but in the absence of restrictions expressed in the applicant’s identification, we must consider G-MEN clothing items to be marketed to all possible consumers of the identified items, including non-football fans." Similarly unavailing was applicant's argument that consumers of its goods, being Giants fans, will exercise care in their purchasing decisions. However, extrinsic evidence cannot be used to narrow the channels of trade when no such restrictions are included in the identification of goods. Here, the goods as identified in the subject application include inexpensive items purchased without a great deal of care or sophistication. Finally, applicant's asserted that there have not been any incidents of actual confusion despite four years of simultaneous use of the two marks. The Board observed, however, that such a statement is "generally entitled to little probative weight in the likelihood of confusion analysis, inasmuch as the Board in such cases generally has no way to know whether the registrant likewise is unaware of any instances of actual confusion, nor is it usually possible to determine that there has been any significant opportunity for actual confusion to have occurred." Balancing the relevant duPont, the Board found confusion likely and it affirmed the refusal. TTABlog note: For some comments and discussion of this appeal, scroll to the bottom of this post. Ringo Starr met with a similar fate in his attempt to register RINGO for various clothing items "all depicting the name and image of a famous entertainer." TTABlogged here. So even if the Giants had restricted the identification of goods to football-related items, would that have made a difference here? For the same reasons set forth in this case, the Board will not consider marketplace factors in its Section 2(d) analysis when deciding an inter partes case. How then could the decision have preclusive effect in in infringement action in district court, where it's all about what is happening in the marketplace? Yet there is a split in the circuits on that point, and the Supreme Court will consider the issue in B&B v. Hargis. The decision, as shocking as it is to New Yorkers, complies with established TTAB precedent. I thought it would come out the other way because in my mind at least, G-MEN has a distinct and very different meaning from G-MAN and we all know that meaning DOES MATTER and often is outcome determinative. I was hoping that this would address a novel issue which is whether "meaning" can encompass "trademark meaning" . In the RINGO case, the marks were identical so the issue could not have arisen. 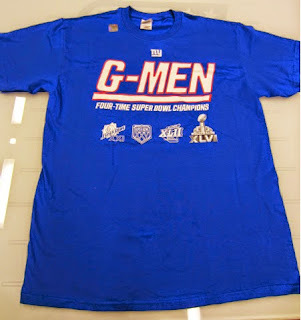 Sadly, G-MEN is apparently only meaningful in the NY area and with NFL fans across the country (isn't that the whole country?). may the fame of either of the marks involved in an appeal affect such scope"
So, fame of the APPLICANT'S mark IS a factor...and it's obviously so obvious what that means that further explanation is unnecessary. I feel so stupid. Should have refused because it disparages G-people, just like Redskins. This case demonstrates the cut and dry mark+ID vs. mark+ID analysis the board takes. As John implied in the first discussion, this was an easy one. Singular v. Plural is almost never enough to distinguish marks, and the goods were identical. Another loss for Eli and the G-Men and a nice victory for GMAN.. for now anyways.